A MASS-photography gathering at Trafalgar Square to defend the right to take photos in public places was a big success, and a lot of fun too. The I'm a Photographer Not a Terrorist event on 23 January, organised by NUJ freelance photographers Marc Vallee and Jess Hurd and others, attracted around a thousand photographers - a rich mix of professionals and amateurs. As well as the usual hi-tech camera kit on display, there was at least one 1930s Kodak box brownie camera in use, and a Victorian-style pinhole camera with photographic plates. A Russian TV crew's interviewer was drowned out by the sound of camera shutters clicking. A very friendly atmosphere prevailed. One photographer shouted to the crowd, "Can you all look this way, for a photo for Associated Press, please?" After everyone had obliged, he confessed, "I'm not really from Associated Press, I was only joking!" Wild cheers of approval greeted demo organiser Jess Hurd when she announced, "We're going to the pub!" 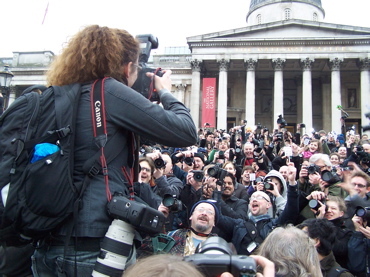 But the demo had a serious intent - to protest against increasingly arbitrary and frequent stops and searches of photographers at the hands of police and Police Community Support Officers (PCSOs) using Section 44 of the Terrorism Act - overturned in January by Branch member Pennie Quinton at the European Court of Human Rights. In the event, there were more fancy dress police impersonators than real cops present at the demo, including a stilt-walking member of the ironic "Vigilance Committee" from whose riot police issue helmet sprung a short pole with a CCTV camera on the end of it. Two PCSOs briefly tried to chase a leafletter through the crowd, before the scrum of photographers documenting the incident gently moved in close enough to make their pursuit impossible. One attendee told me he'd seen a real police officer at the demo, and had overheard him on his radio asking for instructions, "What, completely withdraw, or just hang around on the edges?" The Metropolitan Police have pledged to reissue guidance to its officers telling them not to obstruct law-abiding photographers from taking photos. A statement issued in December by John Yates, the Met’s assistant commissioner specialist operations, issued a statement in December reminding police officers of the need for common sense: "Unless there is a very good reason, people taking photographs should not be stopped." The NUJ website has more details.